For new ideas, Seaman Corporation uses a vast network of resources. As soon as possible we get out into the marketplace and meet with prospective customers. Innovation requires a lot of trial and error. We collaborate with suppliers and constantly screen new raw materials, testing them in our laboratory. Once we have developed a prototype of the new product, we get a sample to our customers. Our innovation team works closely with our marketing team to create educational tools for the sales team. Seaman Corporation manufactures an extensive line of high-performance architectural fabrics. The newly developed light-weight Clearspan Shelter-Rite Tent material has been developed to provide exceptional strength and durability. The tent fabric is 20% lighter than the industry standard, allowing for easier handling and cleanability. Lower weight also means the fabric is easier to install for rental companies, reducing physical labor required during installation. Seaman Corporation will offer fabricated custom panels, colors and widths to meet project and customer specifications. Since 1949, Seaman Corporation has been a global leader in engineering high-performance coated fabric solutions for demanding markets, including permanent architectural structures, commercial roofing, military tanks and tents and geomembrane containment solutions. 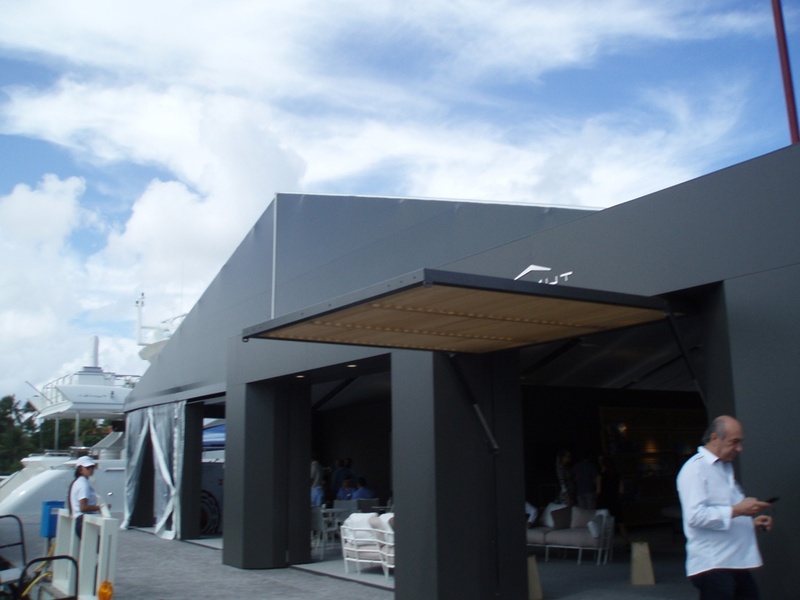 Detail of Losberger's 3820 Shelter-Rite Tent application at the Ft. Lauderdale Boat Show in November 2016. This Shelter-Rite Tent application was manufactured and installed for Peterson Party Center, a special events company based out of Woburn, MA. Product testing is an important part of the innovation process. Here we can see members of the Innovation Department and Application Engineers taking an up-close look at the new Shelter-Rite Tent fabric. Please fill out this form or call Frank Bradenburg at (330) 202-4440 to get more information.